So Joseph discovered Minecraft and wanted to play it. 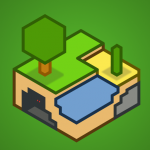 I ended up going with Minetest a free, open source near-infinite-world block sandbox game and a game engine, inspired by InfiniMiner, Minecraft, and the like. It has clients for Ubuntu, Android and several other platforms. He has loved having me go on adventures and build stuff with him. The other day we hit a bug and his character sunk a good couple hundred feet down in the game. I dug down to help rescue him and then I hit the same bug to go deeper past lava and stuff. It was pretty hilarious. I was digging what seemed like forever to get us out. I had no clue the game could go so deep. When they say near-infinite, they mean it. Here is a picture of the castle we built and it’s surroundings. Click on the image to see the full sized version.